Homes for Sale Whispering Trails - Search homes for sale in Whispering Trails. 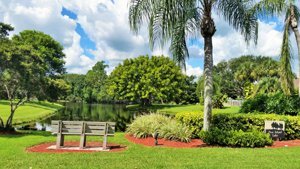 See all MLS Real Estate and homes for sale in Whispering Trails, Jupiter FL. 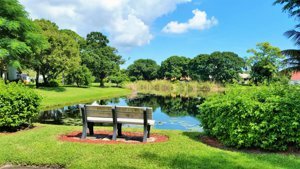 Whispering Trails is located on the north side of Jupiter in a neighborhood lined with mature oak trees. 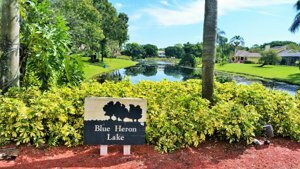 Homes here feature large lots, beautiful landscaping, and lakes spread throughout the community. It is a serene and relaxing environment to live in for all ages, but the homes are ideal for families because of the excellent nearby schools. Whispering Trails residents are also close to Jupiter’s best recreation, shopping, and dining. Real estate in Whispering Trails is made up of single-family homes on large lots that range in size from 2,000 to 4,500 square feet of living space. There are 3, 4, or 5 bedrooms in each home, allowing you to choose the size that best suits your needs and budget. Heated private pools are not uncommon, and many residents have stunning views of the surrounding lakes or preserves. Whispering Trails homes have a distinct design with their red brick and wood exteriors, giving the community the appearance of a northern town. Luxury amenities may include tile floors, granite countertops, grand entryways, screened-in porches, high-vaulted ceilings, and custom cabinets. The landscaping includes full-grown palm trees and the previously mentioned oak trees, which provide beauty and shade from the Florida sun. A peaceful atmosphere is just one perk of living in Whispering Trails. Residents also are close to Jupiter’s recreation, shopping, and dining. The beaches are only a short drive away, and so is the famous Jupiter Lighthouse. Shoppers will enjoy the Gardens Mall, which features upscale designers like Louis Vuitton and Chanel in addition to shops like Pottery Barn and Williams-Sonoma. Visitors can grab a bite at P.F. Chang’s, California Pizza Kitchen, and more. 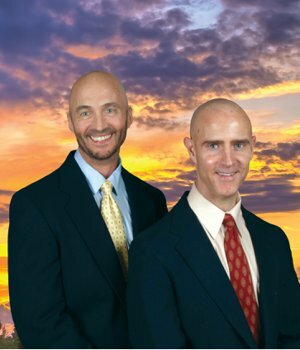 call the Whispering Trails Experts, Thom and Rory. Local restaurant favorites include Little Moir’s Food Shack Cafe and Leftovers, The Dive Bar, Copacabana Cuban Cuisine, and Giuseppe’s Italian Restaurant. There are plenty of choices for all tastes. A newer Jupiter attraction is the Harbourside Place at the Riverwalk, which features an amphitheater, waterfront shops, and eateries. Harbourside plans to expand up the Inlet District to provide even more entertainment. Just across the street is Cinepolis, a new luxury movie theater concept. Visitors can enjoy films in style thanks to the premium concessions, leather seats, and full bar. Learn More About Jupiter Here. The proximity of I-95 gives residents convenient access to the cultural attractions of downtown West Palm Beach in addition to Jupiter’s entertainment. Residents of Whispering Trails are served by the School District of Palm Beach County. Many programs are A-rated, which makes the community perfect for families. Alternative education is offered by private schools in the area. See all currently listed Whispering Trails properties now available below. HOMES IN THE WHISPERING TRAILS COMMUNITY WILL GO QUICKLY WHEN PRICED WELL. BE SURE TO GET ON OUR ADVANCED NOTICE LIST TO RECEIVE IMMEDIATE NOTICE OF THE LATEST LISTINGS PRIOR TO OR WHEN FIRST PRESENTED ON THE MARKET IN THE MLS.